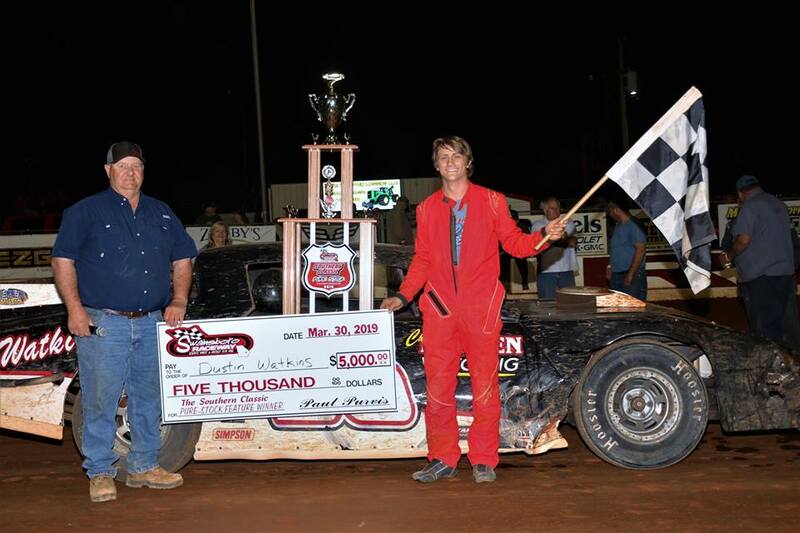 Carpenter Wins at Swainsboro Raceway! 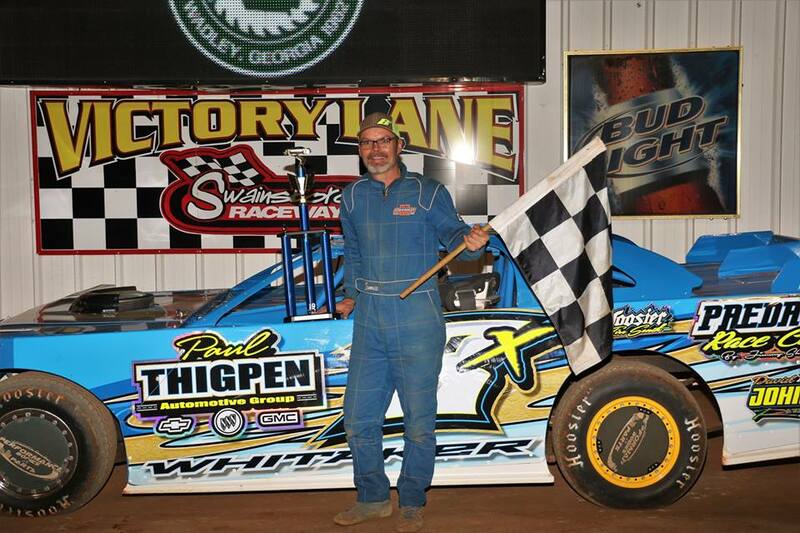 By admin Comments Off on Carpenter Wins at Swainsboro Raceway! 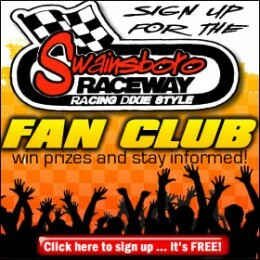 After a couple weekends off from racing action, drivers and fans returned Saturday night to Swainsboro Raceway with only two points races left in the season. Dominos Pizza night at the races began with the Zaxby’s Crate Late Model division. Ches Chester earned the fastest qualifying time with Chesley Dixon sitting outside. After two attempts to start, the front row was moved back putting Brandon Carpenter and Joshua Bishop up front. Brandon Carpenter took the lead but Chester was on a mission hot in second. Bishop makes the challenge for third. Lap 3, Jordan Feider moves in on Bishop to battle for the fourth position. Lap 6, Bishop takes over third as Dixon falls back. Halfway, Carpenter gets loose off two as Bishop searches for a faster lane and Chester makes a move to the inside. Carpenter pull away with the lead. Five to go, caution waives for debris and Bishop takes advantage of the double file restart to move into second. Brandon Carpenter celebrates in victory lane, Joshua Bishop second, Ches Chester third, Jordan Feider fourth, and Chesley Dixon fifth. 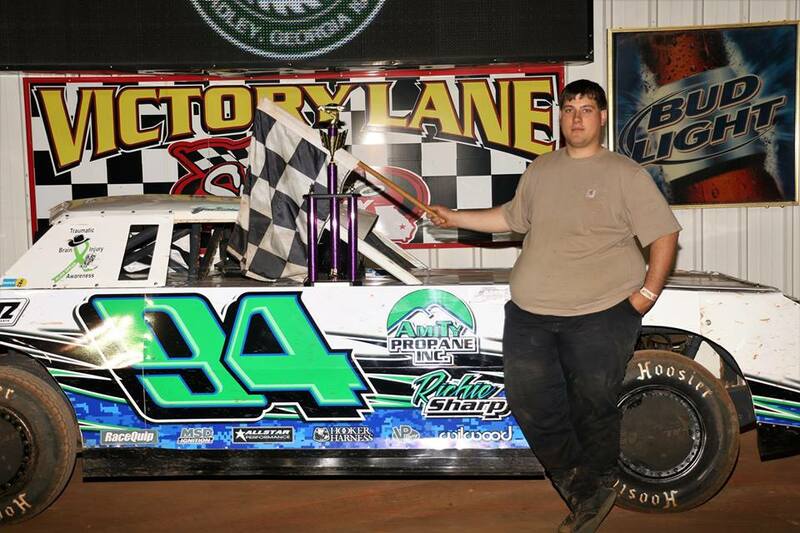 Congratulations as Joshua Bishop clinches his first points championship at Swainsboro Raceway! Up next in the Sunoco Super Street division, top two points contenders and weekend warriors Brent Herndon and Monk Gulledge led the field to green. Lap 1, side by side the entire 3/8 mile coming off four, Herndon takes the lead. Lap 2, Gulledge takes first off two. Lap 3, Gulledge breaks off four and Herndon takes the lead Phillip Burton moves into the second position. Lap 7, Jamey Donaldson looks inside Burton off two but unable to make the pass. Three to go, Dusty Collins breaks in the fifth position. Brent Herndon maintains a healthy lead to take the checkered, Phillip Burton battling several weeks of hard luck finally earns a deserved second place finish, Jamey Donaldson third, Tommy Clinard fourth, and Jimmy Maness fifth. 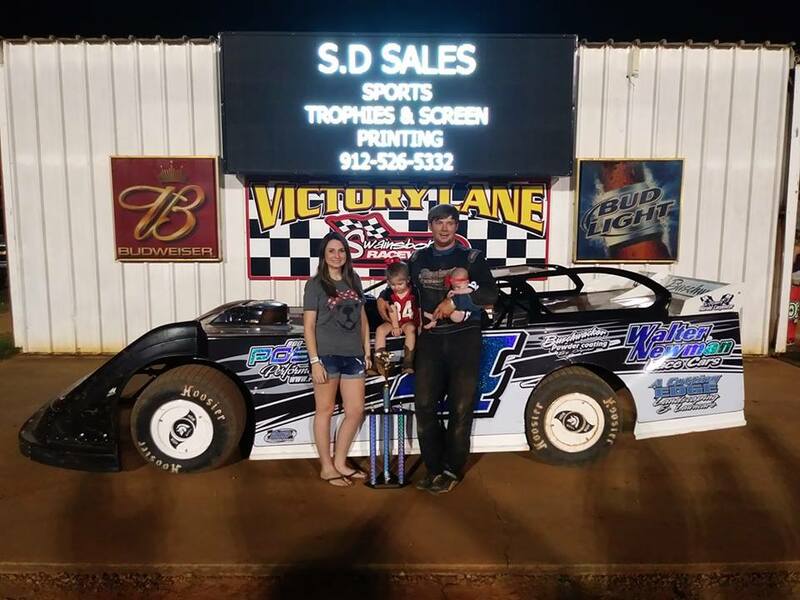 Going into the final points race of the season Monk Gulledge must only take the green flag in order to earn his first points championship at Swainsboro Raceway. In the Southland Insurance 602 Late Model division hot lap qualifying set the pace for two heat races with points leader Terry Lumley and Shannon Graham both earning front row positions. Terry Lumley quickly pulled to the lead but Graham tucked to the inside in two. Lap 2, Ricky McClain gets a run on Graham off four trying for second. Lap 6, Tyler Mimbs closes on Kyle Connell at a chance for fourth. Four to go, McClain makes the move to take over second. Terry Lumley works his way through several lapped cars with a lengthy lead to earn another win for the season and grab the first 2018 Southland Insurance 602 Late Model Championship, Ricky McClain earned his best finish in second, Shannon Graham third, Kyle Connell fourth, and Tyler Mimbs fifth. Rolling out in the Daniels Chevrolet Pure Stock division, Dustin Watkins sat inside front row with Jason Floyd outside. Unfortunately for Watkins, he would be towed in before taking the green. Alex Sturkie moved up to the front row starting position. Sturkie takes the lead with Floyd challenging the outside. Lap 3, Floyd tries the inside and the two make contact in two sending Floyd to the rear. Clay Alexander pits in the fifth position. Justin Durbin making his first appearance at Swainsboro Raceway preparing for the upcoming $5000 to win tries the outside of Roger McKenzie and moves into the fourth position. Lap 6, McKenzie waste no time taking over moving into third. Five to go, after restarting in the rear, Watkins moved back to the fifth position. Alex Sturkie holds off Tyler Sanders to take his first ever Daniels Chevrolet Pure Stock checkered. In post race inspections, Tyler Sanders was declared the winner, Roger McKenzie second, Dustin Watkins third, Brent Herndon fourth, and Justin Durbin fifth. 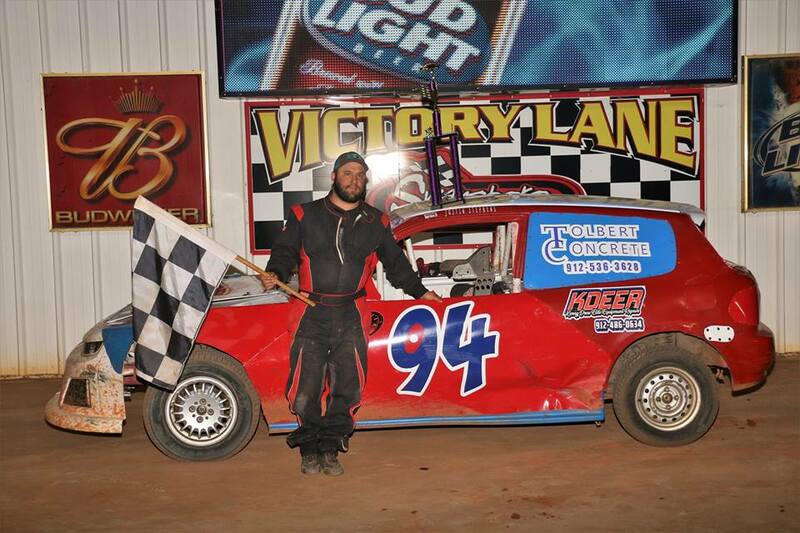 George Williamson earned the 2018 Daniels Chevrolet Pure Stock Championship! 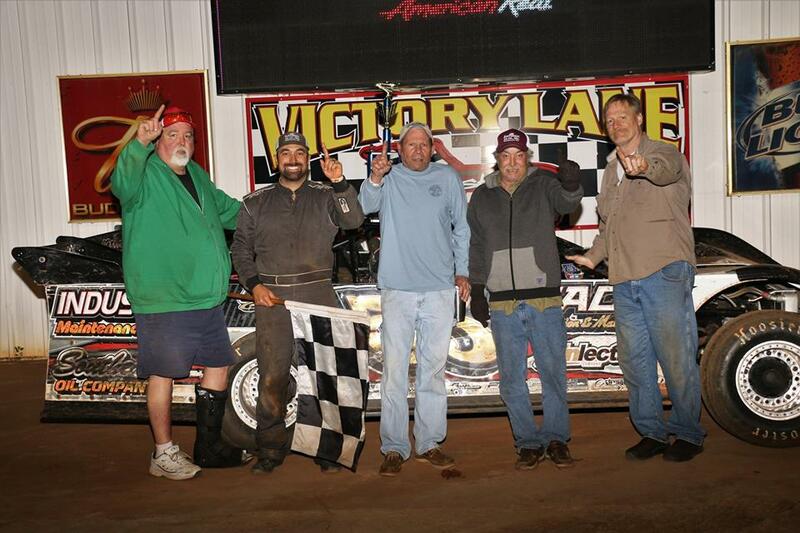 In the Scare House of the South 440 division Rod Morris earned hear race win and Mike Wilson earned his first ever heat race win to lead the field to green preparing for next weeks $4400 to win feature event. Rod Morris jumped to the lead with points leader Tyler Davis in second. Cody Atkinson moves into third. 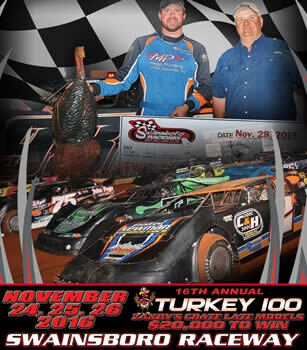 Rod Morris checks out with the win followed by Tyler Davis in second, Jordan Fowler third, Cody Atkinson fourth, and Mike Wilson fifth. Heading into the biggest race of the season for the SHOTS 440 and the last points race of the year the pressure is intense as only 16 points separate Tyler Davis and Rod Morris for the championship. Dublin boys Graham Stevenson and Jaime Foskey led the Roger Wheeler Construction Road Warrior division to green after winning heat races. 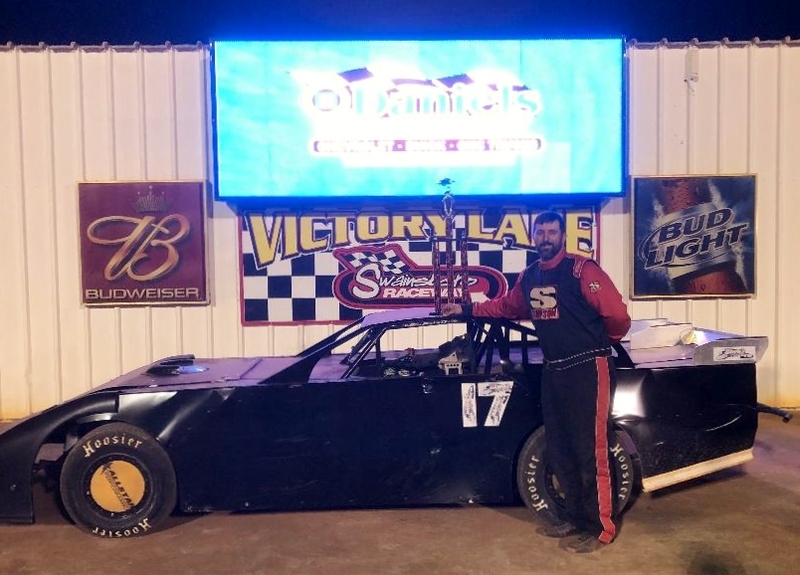 Sporting a brand new look and on a mission to maintain his small points advantage Jaime Foskey took the lead, Stevenson second, Kip Poole third. Foskey gets loose off two and Stevenson closes the gap but Foskey maintains. Three to go, leading the points the entire season Robbie Bland looks to the inside of Poole for third but fails the attempt. Jaime Foskey leads green to checkered to sit in victory lane, Graham Stevenson earns second, Kip Poole third, Robbie Bland fourth, and Tommy Davis fifth. Heading into the final points race of the season, Robbie Bland has led all year, however, due to “mulligan rule” of dropping two lowest points races at the end of year, Jaime Foskey will lead going into the final points race by 18 points.